Seeking consensus regarding using a high pass or full range for my subwoofer. Two different techs at the subwoofer manufacturer garnered two different responses. McIntosh rep says high pass. 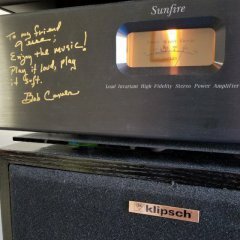 Seems to me on a "common sense" level that filtering all that signal through the sub , then back to the main amp would degrade that "McIntosh sound". Thank you in advance. I don't know much but I'm learning. If the manufacturer cannot give you a straight answer knowing they designed and tested their product before putting it on the market, our opinion would would only be a guess at best without knowing the driver T/S parameters and cabinet volume. High passing is not going to hurt anything but you may miss out on program material, if the subwoofer was designed properly it should have a high pass already installed in the amplifier itself to prevent driver damage. Would a couple of Y-RCA cables splitting the signal from the mac's pre-amp output, one side going directly back into the power-amp input on the mac and the other side feeding the subwoofer, work instead? Were you referring to high passing the main loudspeakers to integrate the subwoofer ? Maybe i just read the post wrong. Still trying to understand it actually. My apologies for any misunderstanding. The way it's explained to me is that if I did it pbphoto's way, that would be full range. If I ran the two rca cables to the inputs on the sub from the amp and run two from the output back to the amp, that would be operating in high pass. I think I understand this correctly, please let me know if not. By running full range, the woofers on the speakers as well as the sub are working bass, but if I did high pass, the bass is solely the work of subwoofer bypassing that signal to the speakers. I'm told most folks do the full range as pgphoto explained, but I understand that pros and cons are related to either option. So basically given my set-up, just wondering based on everyone's personal experience which would sound better? You like how the Heresys match up with the McIntosh? I've taken a leap of faith but given the characteristics of both units, they seemed like a good fit to me. At least on paper. There is not need to run the speaker or sub full range. The ideal is to blend at some XO point. That sub does not have line level inputs which would work best. I don't have an answer and need to think about this problem. You can also try both ways since you get the final decision on what sound best: just proceed with caution at a reasonable volume. You certainly don't want the sub playing over 100 Hz unless it is right next the the speakers or between them. So do the sub experts or the OP mind if I ask a more fundamental question? CL is running Heresys right? He want to optimize Sub to go with it. Do you start with figuring out what is the best crossover point for Heresy for sub? Let's say that is 60 Hz, I have no idea, just throwing a number. That is determined by where FR drops off by 3db from flat, or thereabouts? Assuming it is 60, there's a knob or some adjustments on the back of that Sub from some number to some number, and hopefully it is rated at 60 HZ. His his sub powered? I saw someone say it won't take line level, does that mean it is unpowered? It says it is 500 Watts, 1100 peak, so I'm assuming not. Is his question whether he should power his sub with the internal amp, or the Mac Amp? Or what signal to send to the Sub? What signal could go to the Sub that bypasses the Mac? That newer Mac is going to have THD at max output, from 20 to 20 at what .006 or so? Can you really hear Mac sound from a Sub being used to cover 20 to 60 Hz.? I know you can hear Mac sound, it's about all I have, but can you here it through a powered sub, or even one that is unpowered? I guess I don't understand what his connection options are with that Sub, which the Sub experts know. That is what I guess I am asking. What is his ideal Xover point. If it is two high isn't CL going to be taking away from the sound of his H woofers? He has two problems, the sub does not have high and low level inputs and the integrated amp does not have a line level input form a pic I looked at on the net. This is a problem with a lot of integrated amp, no line level output for a subwooer. In the old day a sub with high and low level inputs would let you run the speaker wire from the amp to the sub and then wires from the sub to the speaker. This type of setup was popular in the era of passive subwoofers. Times have change and a lot of people don't buy big speaker for their home. Also, with the rise in movie watching with 5.1, etc, the subwoofers now come with their own amp. Avr's have their own hpf/lpf and things are taken care of. He has two problems, the sub does not have high and low level inputs and the integrated amp does not have a line level input form a pic I looked at on the net. 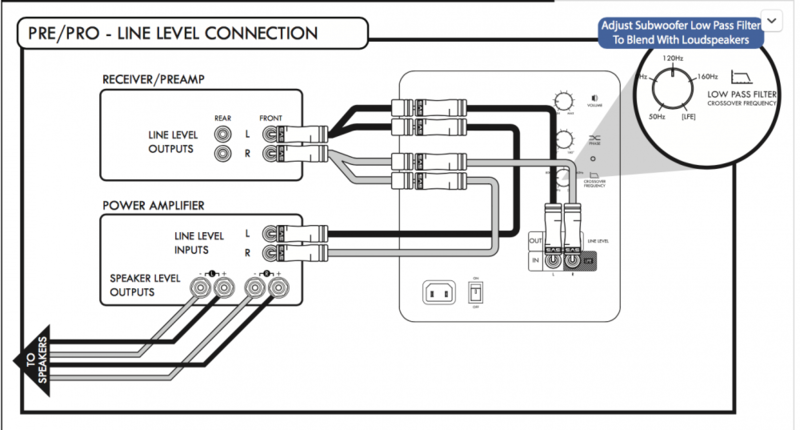 That picture I posted is directly from the SVS-SB2000 manual - it appears like it has line-level inputs. On the MA5200, he can remove the jumpers between the pre-amp outputs and the power-amp inputs and use Y-splitters to route the full-range signal to both the H3's and the sub. At least that's what I would do - like the picture. He will have summed bass from the speaker and sub. I don't have a better solution. The signal may also run into an impedance mismatch in the speakers and sub. A bit rest tonight and maybe I will have a better grasp of the full problem. It at least for now, will result in a compromise somewhere. 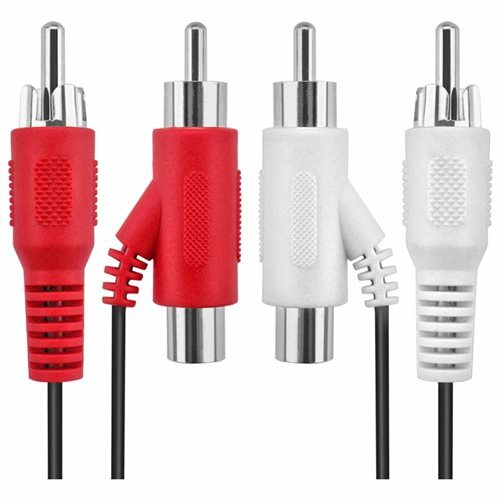 I've used the "piggyback" style RCA's before and they worked great, same as a splitter pretty much. pbphoto summed it up nicely in the illustration above, the OP just needs to adjust the settings on the back of the subwoofer to get it to blend properly and its finished. The crossover point will be where the Heresy woofer naturally rolls off and the subwoofer low pass adjustment is made on the back panel of the subwoofer. That answered my questions, thank you. My first sub had both line level connection (from LFE) and speaker wire terminals, but wasn't passive. The Mac HT processor I had at that time had both an LFE Out, and speaker terminals for Sub. This was way before HDMI. Conceptually it's really simple. Any system has a natural "roll-off" point where the system output begins to go down below that frequency....the rolloff frequency. So when a speaker (system) rolls off, something else, needs to take over. In this example, the Heresy's roll off at a point, at which point the subwoofer takes over. This system is in place within speakers too, so the tweeter and woofers (and midranges) have roll-off points, at which point another speaker takes over (midrange takes over the tweeter, woofer takes over for the midrange). Within a speaker these are handled by the crossovers. The goal is usually to have a smooth transition, so that the rolloff from one speaker to the next is seamless. When woofers and subwoofers are involved, there is also a headroom issue -- if you have the ability to cross over the speakers using an AVR, then the AVR can allow the transition (crossover) between the speakers to be moved to a different frequency above the roll-off. The benefit is that the subwoofer takes over the low end tones that the woofer would normally handle, and in doing so, it frees up the woofer to handle the other frequencies and less of the very demanding low bass frequencies. So in a situation without an AVR, the crossover is set by the speaker's own rolloff -- there is no ability to change this frequency up. WIth an AVR with typical crossover controls, you could move up the crossover point (where the handoff occurs) to a higher frequency say 80hz, and give the Heresy speakers a bit more headroom to work with. Lower distortion tends to be a benefit. When the conversation involves what is typically just a few watts being used (a 99db efficiency speaker isn't using 100 watts! )....the headroom/distortion issue is likely unimportant with a quality speaker. The design of those heritage style speakers is such they know and expect many users to be doing exactly what is being done here in this thread. Why couldn't he use his preamp out to send the signal to the sub and use the subs crossover or has that been suggested? That has been suggested and is exactly what he needs to do but he will need some sort of RCA splitter as there appears to only be one set of pre-outs on his integrated unit and they are connected with jumpers. If the jumpers are removed I'm fairly certain it removes the onboard amp from the processor, which is a nice feature to have on an integrated amplifier, leaves the opportunity open for external amplification, or, in this situation the ability to send the signal to a subwoofer.